To anyone who is trying out the beta resource pack, it was updated last night and you should download the update! New Quest World Beta Pack update! Deadman's Marsh's mobs are finally textures, the rats from the thieve's district are added, reinforced armors all have icons, and the reinforced helm texture was fixed. /questitems now shows the texture of the item. 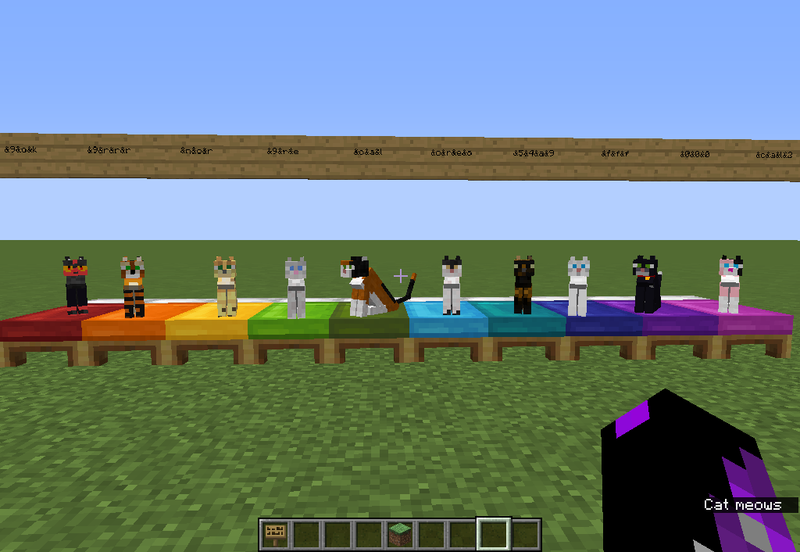 Below I have a screenshot containing 10 new tamed ocelot textures you can give your feline friends! Above each ocelot is the key to unlock their texture. At the end of their name, add the code shown on the sign above the cat who's texture you want. The code will not show on the cat's name, but it will change the cat's texture upon the cat getting the name, or if you name the cat before taming it, it will get the texture upon taming. Deep apologies if the codes are hard to see. Small monitor means low res images. Just did a tiny update to the beta pack, added all the elytras from the beta into the full and lite, and added a link to all 4 packs on a different site so people don't have to use mediafire. Also finally remembered to put beta in the beta pack's name.